A colloid is a way of organizing matter and, by extension, a hydrocolloid is a way of organizing water. (For the geeks: hydrocolloid is a culinary term for long-chain molecules that are attracted to water, technically known as "hydrophilic polymers." Gesundheit!) Think Jell-O-liquid particles trapped in a solid matrix. Hydrocolloids also occur in nature. Lettuce is nothing more than a crunchy water bottle, comprised of more than 98% water! Man-made hydrocolloids include jams and jellies (gels), vinaigrette (an emulsion), and whipped cream (a foam). Gels are simply water made solid. They're the type of hydrocolloid we'll look at first. Imagine a mesh of intertwined molecules that keep water from sloshing around. 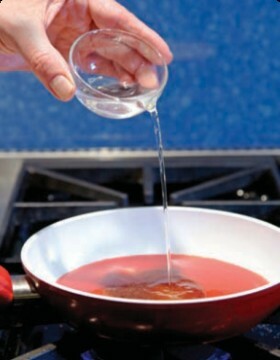 Though many ingredients help create gels, there are broadly two classes: carbohydrates that gel and proteins that gel. Cornstarch is the best-known carb gelling agent. Agar-agar is another. 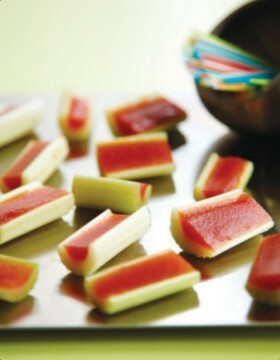 Gelatin is the best-known protein gelling agent. Casein, the protein in milk that makes cheese possible, is another. Then there's myosin, a protein that helps muscles contract.And when that muscle (meat) is cooked, myosin denatures and gels. . . . Yes, cooked or cured meats are also gels! 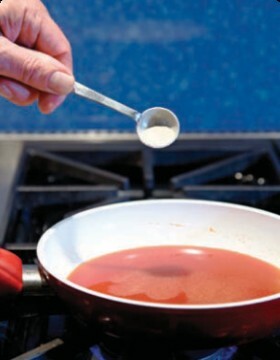 Boil 120 mL tomato juice, 1 t Worcestershire, ½ t celery salt, 1 t agar-agar, 1 t hot sauce. Stir in 60 mL vodka. Pour mix into 1 bunch celery ribs. Chill 30 min. Nearly any vodka will work for this recipe, but Josh Volz (previously bartender at Marvin in D.C.), a walking encyclopedia of cocktail knowledge, recommends Hangar One Roasted Chipotle Vodka when making a Bloody Mary. 00. 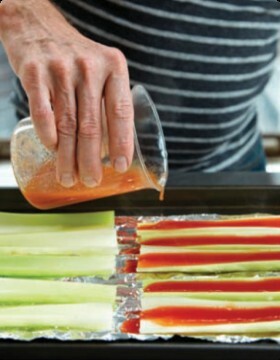 Fold a long sheet of aluminum foil into pleats (ridged like a tin roof) and put it on a baking sheet. Nestle the celery ribs between the pleats, open side up. 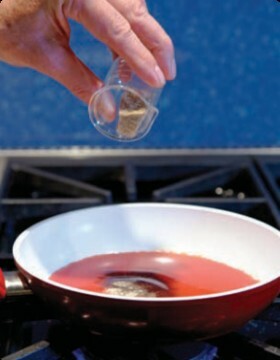 This will help keep them from tipping and spilling the tomato juice mixture. 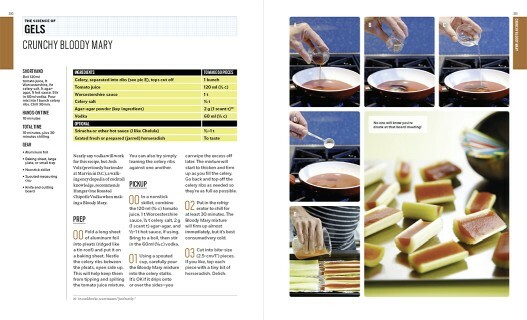 You can also try simply leaning the celery ribs against one another. 00. 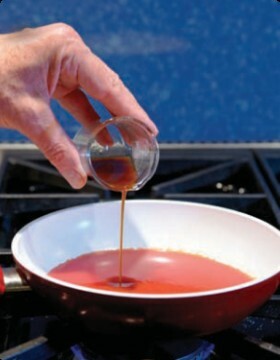 In a nonstick skillet, combine the 120 ml (½ c) tomato juice, 1 t Worcestershire sauce, ½ t celery salt, 2 g (1 scant t) agar-agar, and ½-1 t hot sauce, if using. Bring to a boil, then stir in the 60ml (¼ c) vodka. later. The mixture will start to thicken and firm up as you fill the celery. Go back and top off the celery ribs as needed so they're as full as possible. 02. Put in the refrigerator to chill for at least 30 minutes. The Bloody Mary mixture will firm up almost immediately, but it's best consumed very cold. 03. Cut into bite-size (2.5-cm/1") pieces. If you like, top each piece with a tiny bit of horseradish. Delish. 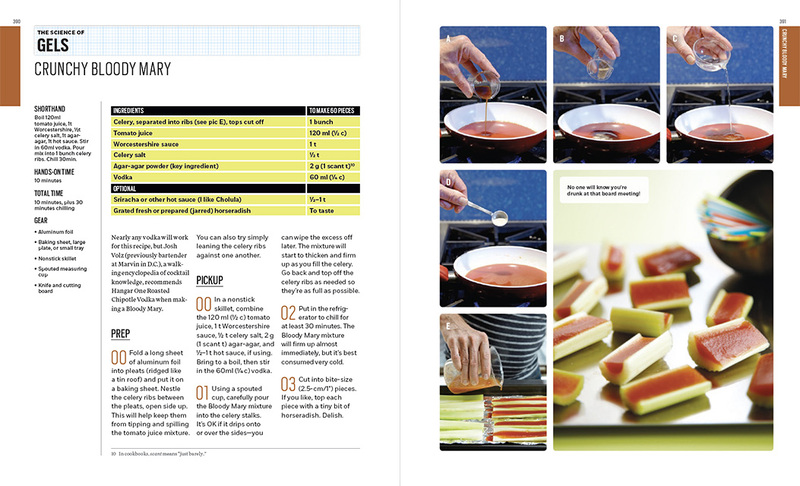 Here's what the recipe looks like in the book. 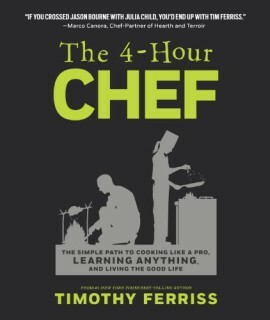 The 4 Hour Chef: The Simple Path to Cooking Like a Pro, Learning Anything, and Living the Good Life is available in hardcover from Amazon.com. Timothy Ferriss is the author of the #1 New York Times bestsellers The 4-Hour Workweek and The 4-Hour Body. He has been listed as one of Fast Company's "Most Innovative Business People of 2007", Forbes Magazine's "Names You Need to Know in 2011," and is the 7th "most powerful" personality on Newsweek's Digital 100 Power Index for 2012. I nested the celery in a bed of dry beans. That shaved half the prep time off this very simple recipe, and is more re-usable. Delicious either way!